Can't find a copy of the latest issue? Get the most sought after auto magazine in Montana right here! 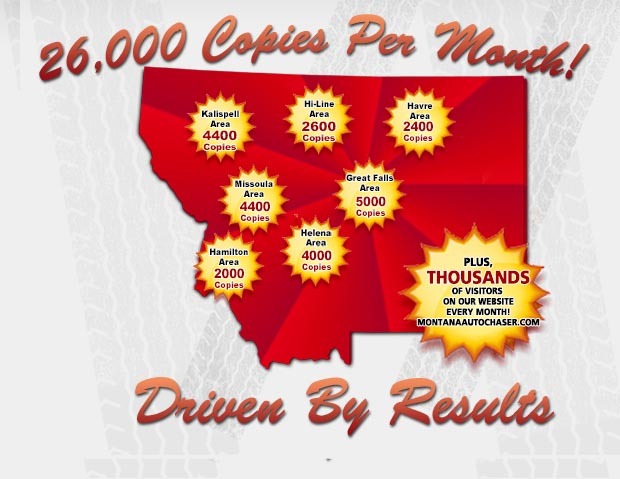 We saturate Montana like no other automotive publication in the state! Crazy Mickey's Montana Auto Chaser is a print and online marketplace containing Montana's best selection of new and used cars, trucks, SUVs, vans, motorcycles, trailers, 5th wheels, RVs and other vehicles for sale. We distribute 20,000 copies twice monthly to Great Falls, Helena, Butte, Bozeman, Missoula, Kalispell, Cut Bank, Shelby, Havre, Chinook, Lewistown, Sydney, Williston and everywhere in between! There's one BIG problem. We have thousands more people who would like to receive our magazine, but we're out of copies! Browse Montana's Best Selection of New and Used Vehicles For Sale. Whether you're looking for a used car in Great Falls, a used truck in Missoula, a boat in Ronan, and RV in Kalispell, or construction equipment in Belt, the Auto Chaser is your first source. Find new and used car dealers all over Montana, and browse their entire inventories on one website. Compare used cars in Great Falls, to used cars in Missoula, Kalispell or anywhere else in Montana to make sure you're getting the best possible vehicle at the best possible price. We give you the tools to easily price shop Montana's most diverse selection of cars, trucks, SUVs, trailers, 5th wheels, motorcycles and construction equipment for sale. Sell Your Next New or Used Vehicle. You can also sell your new or used Cars, Trucks, Vans, SUVs, Motorcycles & ATVs, Trailers, RVs, Equipment and other vehicles in our magazine and on our website. Choose to place your vehicle in both our magazine AND on our website for optimal exposure, or just place it on the website for quick and easy exposure. You can pay for your ad using PayPal, a Credit Card, or a check and once your payment is processed, your vehicle listing is activated immediately. No forms, no hassles. Quick and easy, just how we like it! For more membership details, click here.